Q. What makes us better than our competitors? A. We are well known for supplying high quality office furniture at affordable prices. We deliver what we promise and we are there to listen to your queries and to solve any problems. We pride ourselves on providing outstanding customer service before, during and after delivery of your purchase. There is always a friendly voice to listen to any queries at any stage of your project. Q. Is it possible for you to hold a furniture item for me without making a payment? A. Sorry, we do not offer lay-by services and cannot hold an item for you before you make payment. In special circumstances, we may be able to reserve an item for 24 hours, usually if we are running low on stock. Please call and ask if you need us to check stock levels before you purchase your items. Q. Is it possible to buy furniture from you without a credit card? A. Yes, we have several payment methods in addition to credit cards. These include direct bank deposit or paying by cheque. Q. Is it safe to make payment on your website using my credit card? Q. Do I have to pay GST on top of the prices shown on the website? A. All our prices are inclusive of GST. Q. Is there any other way to pay you except online payment? A. Yes, you can call us and request that we email/post you a tax invoice. You can then make a payment by direct bank deposit or by sending us a cheque. Q. Do you accept all credit cards? A. At present, we accept payments made through American Express, Visa and Master Card. Q. The furniture items on your website do not meet my requirements. Can I get customized furniture items? A. Yes, it is possible to get non-standard items custom made according to your requirements. Please feel free to talk to our representative to confirm your requirements and you will be supplied with a quick quote. Q. Can I get a printed catalogue of your furniture range so as to order after consultation with my employees? A. Unfortunately not. Our range is very diverse and we are always sourcing new and exciting products for our customers. Our full range is available on our website, and this is updated daily. Q. Is it possible to check your furniture in person before buying? A. Yes, Fast Office furniture has small showrooms set up in Brisbane, Sydney, Melbourne and Perth where customers are welcome to inspect our range. Visits are by appointment only, so please call our office on 1300 327 863 to confirm. Q. Do you deliver to all places in Australia? 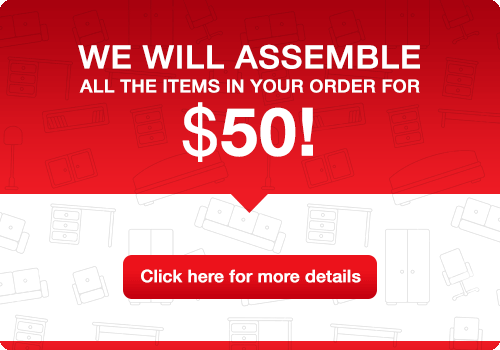 $40 – flat pack delivery, $90 – premium delivery and assembly service (includes placement and removal of rubbish). Please use our quick and easy Delivery Cost Calculator located at the top right hand side of each page to check whether your postal code falls into one of our metro areas. If it doesn’t, please give us a call and we will provide you with a quick and cost-effective quote to your area. Q. Is it possible to return the order if I do not like the quality? Q. What if I have received a damaged or faulty furniture item? Q. How can I track delivery of my order? A. It is the policy of Fast Office Furniture to keep our customers informed at all times during purchase and delivery. We send an email soon after placement of your order to let you know which day it will be delivered. Our drivers will also call half an hour before arriving to give customers some notice. Q. Can you deliver on weekends? A. We deliver Monday to Friday – 8:00am to 5:00pm. Unfortunately due to the many variables affecting our truck schedules – traffic, roadworks, delays at installations etc, we are unable to advise a specific delivery time. However, we will confirm the delivery date and our drivers are happy to give you a call prior to delivery to give notice of their arrival. Q. Our office is on level 6. Is there any additional cost to deliver to us? A. No. Our delivery and assembly charges are the same whether we deliver to a ground floor or above ground floor address. We ask that you advise us of the availability of a lift so that we can send additional delivery staff if required. Q. I want to buy office furniture for our school, but our policy states that we must receive the goods before we pay for it. Can you help? A. Payment for our products is generally required before we deliver. However, there are some special circumstances. We understand that some government departments & agencies, schools and educational facilities are not able to make payment before receiving goods. In this instance, please contact us on 1300 327 863 or email us here [email protected] to discuss. We may be able to accept a Purchase Order and invoice on delivery with 7 day payment terms..